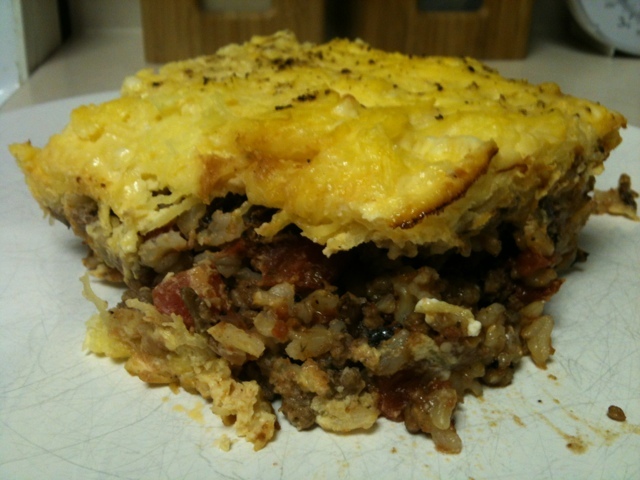 food: greek shepard pie | eat. drink. fly. I liked that this recipe featured ingredients I liked, ingredients that I already had, and seemed like a husband-pleaser. so I gave it a test drive. I fed this one to my brother & husband and both of them inhaled it so quickly that I barely got a portion. so I made it again on tuesday. we tried doing it as a “make ahead” and preparing it to the point of the oven and then popping it in the fridge…and baking it the next day. this also worked perfectly. so here’s the recipe as I made it. the original was doubled in size – but my version still makes 4 portions – a 9×9 casserole dish worth. …and I changed the tomato sauce to canned fire roasted tomatoes. cook the ground beef, onion & garlic. drain off fat if desired. add spices, rice & tomato. cook for 5-10 minutes until well combined and simmered down. fill bottom of casserole dish with meat mixture. combine items for topping in a separate bowl. spread on top of meat mixture. bake at 350 for 45 minutes. let sit 15 minutes before serving. and here’s a tip for the squash… cut it in half and microwave it for 10 minutes facedown in a dish covered with a touch of water. let it cool then shred with a fork. pretty healthy, damn tasty and easy peasy. so a perfect winter meal in my books. enjoy! as much as that mushroom tart looks delightful! wow. The greek pot pie mighty be even more up my alley. I’m envisioning this recipe made with ground lamb. Kudos on the new digs. I’m enjoying your tales of culinary adventures, libations and travel!